Welcome to GeoCheck. Using this page you can place a link in your cache description on Geocaching.com, which will allow users to check whether their coordinates are correct. This is particularly useful for Mystery or Unknown cache owners. As cache-owner you can upload an image and text to display to successful geocachers and list further child waypoints e.g. good nearby parking spots, trailheads etc. Register an account and enter the coordinates to your cache! If a user inputs the correct coordinates, you can design a custom response page including user-defined text and images. You may also include additional waypoints in the form of nearby parking, trailheads etc. 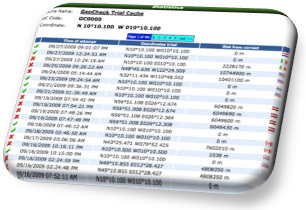 All coordinates can be downloaded as GPS/LOC files or sent directly to Garmin GPS receivers. As the cache-owner, you decide if the users must enter the coordinates exactly or if a 'fuzzy' solution is allowed choosing between ±3 meters, 10, 30, or even user-defined distances. 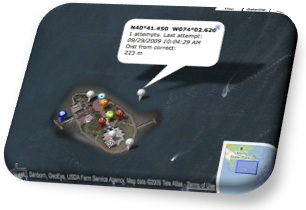 Using a Google Map, cache-owners can easily view your defined solution, 'fuzzy-factor', waypoints and all the attempted coordinates from the users. 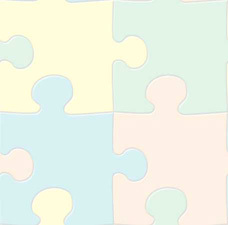 Heavily tried coordinates will appear as dark markers, while rarer coordinates will appear lighter colored. Clicking a marker reveals further information including the number of tries, time of last attempt, and distance from the correct position. You may define multiple sub-coordinates for your cache. Using the Google Map, you may notice a particular set of wrong coordinates being tried often. 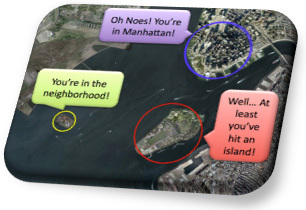 In this case, you can provide the users with a helping hint when they try the wrong coordinates. Each sub-coordinate can be defined as requiring exact coordinates, or allowing 'fuzzy' solutions - just like a regular solution. You may create as many solutions you wish. 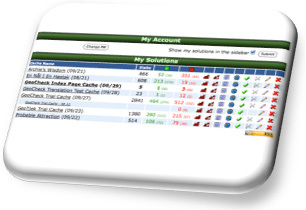 From your central account page you can view all the details concerning your caches including the number of attempts, how many succeeded and how many failed. From this page you can also edit your individual caches, add waypoints, sub-coordinates, view the Google Map, view statistics and much more. You can view a complete list of attempted coordinates, the time of the attempt, distance from the correct coordinates and even the nationality of the person behind the attempt based on their IP-address. The statistics on correct attempts and wrong tries may be grouped by IP. Though you cannot assume constant IP addresses for all the users, this page will give you an idea of the number of attempts by each user. For security reasons, the IP-numbers are encoded, but will remain constant for a given IP-number allowing you to track individual IPs across your caches. 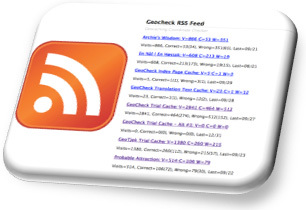 You can subscribe to an RSS feed of all the caches listed in your account allowing you to track the number of correct and incorrect attempts and visitors remotely.